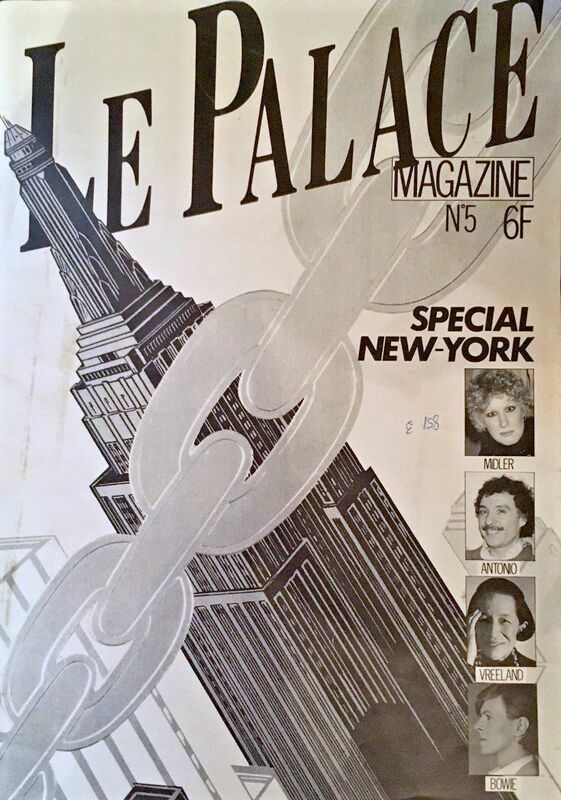 This interview by Alain Pacadis appeared in French in Le Palace Magazine 5 (1981). An eBay seller very kindly provided a scan of it and RealityStudio translated it into English. It is not to be found in Burroughs Live: The Collected Interview of Wiliam S. Burroughs. 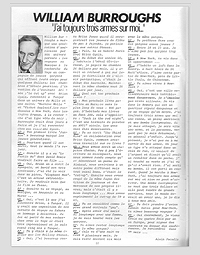 William Burroughs has impressed a generation of Americans with his warped universe: expeditions to Mexico in search of Yagé in the company of young boys who offer their bodies for a few dollars; decrepit hotel rooms; the invention of nonlinear writing, “the cut-up” with Brion Gysin, whom he met in Tangiers in an atmosphere reminiscent of the Thousand and One Nights; Soft Machine and the Ticket That Exploded. Walking in circles in New York, Lexington Avenue, looking for a guy dressed in black. 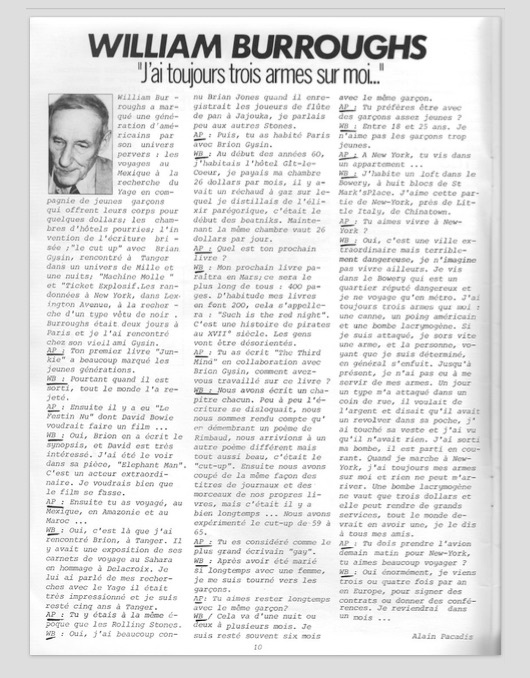 Burroughs was in Paris for two days and I met him at his old friend Gysin’s place. Pacadis: Your first book Junkie has made a mark on young people. Burroughs: Yet when it came out, everyone rejected it. Burroughs: Yes, Brion wrote the screenplay, and David is very interested. I saw him in the play The Elephant Man. He is an extraordinary actor. I would like to see the film get made. Burroughs: Yes, that’s where I met Brion — in Tangier. There was an exhibition of the sketchbooks he made in hommage to Delacroix while traveling in the Sahara. I told him about my research into Yagé. He was very impressed and I stayed five years in Tangier. Pacadis: You were there at the same time as the Rolling Stones. Burroughs: Yes, I got to know Brian Jones when he was recording the pipe players of Jajouka but I didn’t talk much to the other Stones. Pacadis: Then you lived in Paris with Brion Gysin. Burroughs: In the early 1960s, I lived in the hotel Gît-le-Coeur [the Beat Hotel]. I paid $26 a month for my room. There was a gas stove where I cooked up paregoric. It was the beginning of the beatnik movement. Now the same room is worth $26 a day. Pacadis: What’s your next book? Burroughs: My next book will be published in March . It will be the longest of all of them: 400 pages. Usually my books are about 200. It will be called: Such Is the Red Night. [sic — Cities of the Red Night] It’s a story about pirates in the 18th century. People will be confounded. Pacadis: You wrote The Third Mind in collaboration with Brion Gysin, how did you work on this book? Burroughs: We wrote a chapter each. Gradually the writing grew more fragmented. We realized that by dismembering a poem of Rimbaud we could arrive at another poem, different but just as beautiful. It was the “cut-up.” Then we cut up newspaper titles and parts of our own books in the same way, but it was a long time ago… We experimented with the cut-up from 1959 to 1965. Pacadis: You are considered the greatest “gay” writer. Burroughs: After being married for a long while to a woman, I turned to boys. Pacadis: Do you like to stay with the same boy for a long time? Burroughs: It ranges from one or two nights to a few months. I have often stayed six months with the same boy. Pacadis: Do you prefer to be with young boys? Burroughs: Between 18 and 25 years old. I do not like boys too young. Burroughs: I live in a loft on the Bowery, eight blocks from St Mark’s Place. I love this part of New York, near Little Italy, Chinatown. Pacadis: Do you like living in New York? Burroughs: Yes, it is an extraordinary city but extremely dangerous. I can’t imagine living anywhere else. I live on the Bowery which is a dangerous neighborhood and I only travel by subway. I always have three weapons on me: a cane, brass knuckles, and a can of tear gas. If I am attacked, I quickly take out a weapon, and in general the person, seeing that I am determined, runs away. So far I have not had to use my weapons. One day a guy attacked me on a street corner. He wanted money and said he had a revolver in his pocket. I touched his jacket and saw that he had nothing. I took out my tear gas and he ran off. When I walk in New York, I always have my weapons on me. Nothing can happen to me. A can of tear gas costs only three dollars and it can come in handy. Everyone should have one. I tell all my friends. Pacadis: You have to take the plane tomorrow morning for New York, you like to travel a lot? 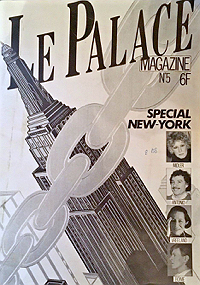 Original interview published in French in Le Paradis Magazine 5 (1981). Posted to RealityStudio on 18 November 2017.
awesome! Thank you. Filing all boardroom reports. Really enjoyed reading this! Thank you for translating and posting!